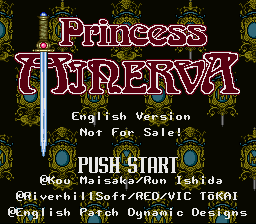 Princess Minerva is a role playing game for the Super Nintendo. An anime with the same title was released and serves as the game’s prequel. Princess Minerva’s game’s intro starts when Minerva gets bored one day and decides she is going to form a group of bodyguards because it seems like it would be a fun thing to do. So, she does exactly that. She forms a group of bodyguards from various ladies of differing backgrounds and hopes to see them in action fighting very soon. It isn’t long until she gets her wish either. 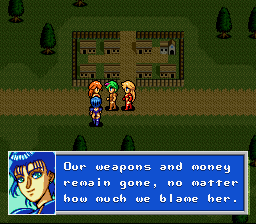 Bluemoris, her trusted servant and aide, doesn’t like the idea much but is powerless to stop her. 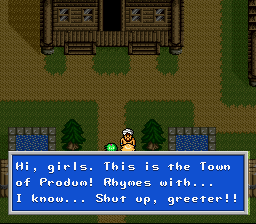 The gameplay portion begins when the girls are already united. Dynastar tells her old master she must leave him and sets the stage for her plans to attack the country of Whistler and its territories. Then the game switches to Minerva and her party doing training in (aka lazying about) the castle’s heated pool. 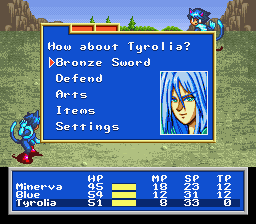 As Minerva laments the fact she hasn’t had a chance to see her bodyguards in action, one of Dynastar’s minions attacks them and sets the stage for the rest of the game. Minerva gets her wish to see just what her team of lovely ladies is capable of as the team sets off to stop Dynastar and her dastardly plans. 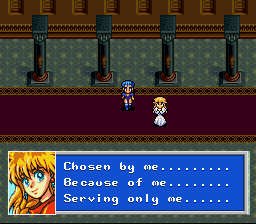 This is a complete English translation of Princess Minerva for the Super Nintendo.